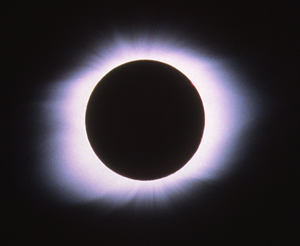 What follows dates from February 1998, when we visited the island of Curaçao for what had to be one of the most glorious coincidences of all time— a total eclipse of the sun occurring within a few days of Mardi Gras. Naturally I managed to get in some fine eating, diving, and drinking as well. Enjoy. big bag of dive gear, a large and implastic telescope). The Princess Beach Hotel was geared to very rich American tourists. This is the place to go if you want to drink four-dollar beers or six-dollar cocktails (plus tax, plus automatic 10% service charge). The casino does its business in dollars. We ate a dinner which was gastronomically merely okay, but which set us back surprising amounts of money. And who are “we,” you ask? I, Walter Jon Williams, your host. Kathy Hedges, my spouse and astronomical advisor. And our two friends Eileen Comstock, an M.D. from Socorro, NM, and her husband Warren Marts, computer guy, sometime geologist, and former Microserf (“I got to the point where I had lunch with Bill Gates, and then I quit.”). As the result of a spinal injury sustained when he fell off a mountain in Oregon five years ago, Warren spends most of his time in a wheelchair, though he can also get by with crutches, a brace on his useless left leg, and large amounts of true grit. 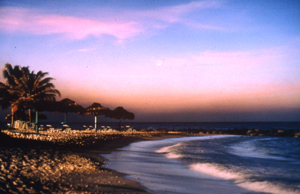 Curaçao is part of the Netherlands Antilles, otherwise known as the ABC Islands, for Aruba, Bonaire, and Curaçao. It is no longer a colony, and since the 1950s has been administratively part of the Netherlands, though it has a local Parliament, the chief function of which (according to some of the complaints I heard) is to raise taxes enough to destroy local business, wreck the economy, and keep the population dependent on government handouts. by Juan de Ampues, who brought in cattle, goats, sheep, horses, and 200 slaves. An attempt to start a plantation of Valencia oranges failed when the oranges turned out wrinkled, withered, and largely moisture-free, but the highly concentrated flavor later turned out perfect for making Curaçao liqueur. In 1634 the Dutch West India Company conquered the place and founded the city of Willemstad on a large natural harbor. The Dutch knew the island was unsuitable for plantations– though this did not stop them from founding a lot of them — but wanted it for the easily fortified natural harbor and for the general purpose of boosting their trade throughout the Caribbean. One of the first governors was none other than Peter Stuyvesant, the one-legged character who was also governor of New Amsterdam. One of the island’s unique characteristics was the large settlement of Sephardic Jews, settled by the Dutch beginning in 1651. The Sephardim, expelled from Spain, were believed capable of trading with the Spanish. They flourished on the island, at one point owning over 1200 ships and providing the island with 200 sea captains. Temple Mikve’ Israel, consecrated in 1732, is the oldest synagogue in the Western Hemisphere. the crime rate is skyrocketing, and drugs are everywhere. In school the children learn Papiemento, Dutch, English, and Spanish. Dutch children, who might return to the Netherlands, are given the option of learning German instead of Spanish. After dinner, we took a swim in the pool, gazed at the ocean and palm trees, had some six-dollar cocktails, and generally kicked back. Our divemistress was Vivienne, a Dutch woman who was, let’s face it, a babe. She was a student who worked as a divemistress to earn her way through college. She was a sight for my sore, jetlagged eyes, and flirted with me quite pleasantly on those occasions when we had a chance to chat. We zoomed out through the breakwater and right into El Niño. Due to worldwide weird weather, the northeast trades hadn’t hit the island, and we were getting a stiff breeze from due south, which is unheard of. Big waves were slamming into what is normally the leeward side of the island. The boat jumped up and down, spray shooting everywhere. Warren got soaked in his wheelchair, and ended up crawling forward to shelter in the cabin. Vivienne decided to abandon our primary dive site, and the secondary, too. The sea was just too rough. So we ended up in sheltered Directors Bay, so called because it was once the private beach of the directors of Royal Dutch Shell. Vivienne put it. This is pretty much the standard dive plan for Curaçao, one we were to follow for most of our dives. Usually without the squits, however. which don’t provide any thermal protection. Fortunately I am well insulated, and never really got chilled. Having so much equipment fail at once is just one of those things you have to get used to as a diver. Over the brink we went. The coral wall at Curaçao is not a vertical wall like Cozumel or the North Wall of Cayman (which drops 36,000 feet straight into the Cayman Trench). The wall drops more gradually, at maybe 60 or 70 degrees, with lots of broken-up coral blocks that made ideal moray country. The coral at Directors Bay was sort of beat up, though there was still plenty of it. just below us. (I thought the turtle was quite clearly a hawksbill, but others insisted it was a green turtle.) Apparently the turtle wanted a look at us, too, because it swam up within about six inches of my face, then turned around and headed back in the direction from which we’d come. back to the Big Blue. left and nothing better to do, did it all again. Didn’t see much. Lots of large trumpetfish, which are long, skinny fish that do their best to imitate seaweed and generally swim head-downward. I pursued a porcupinefish in hopes of getting it to puff up into a spiky volleyball, but it eluded me. After which lunch, then siesta. Well. Guess which we decided to head for. story, so finally we hailed a cab and said, “Take us to the parade!” The cab got us within a couple blocks, and from thence it was an easy enough walk. 40KV generator and a live band playing the tumba music of the island at ear-splitting volume. (Tumba is pronounced “tambu,” just to make it confusing for the tourists.) Following the semitruck came a sign explaining which outfit was sponsoring this segment of the parade, then lots of children in costumes, then a refreshment truck pouring drinks for the marchers, who by this point had been going for six hours. Then another truck, another parade, and more drinks. After the parade ended, a whole mob of locals followed, dancing to the tumba. The meal turned out to be the best we had on the island. I opened with sopi piska, the local fish soup, tangy and choked with freshly-caught fish, squid, and lobster. I followed with grilled dradu (dorado, king dolphin, or mahi-mahi), with a sauce “in the style of the fisherman’s wife,” with tomatoes, onions, garlic, and ketjap. Kathy had a filet mignon stuffed with Dutch cheese. Top of the line stuff, by jove. The astronomers didn’t know what they were missing. Then back through the darkness and traffic to the hotel for more overpriced drinks, then bed. and going to the last big Carnival parade. During the morning, till it got too hot to move, we wandered about Willemstad.The upscale portion of the town, Punda, is a strange mixture of the Dutch and the Tropical. The buildings tend to be tall and narrow, as in Amsterdam, and feature the traditional Dutch baroque gable-ends and other architectural features. (The penchant for lace curtains is another carryover from the Old Country.) But the buildings are painted in blazing tropical colors, in particular an avocado green and a distinctive shade of mustard yellow. governor owned the paint factory in Holland that supplied the island. We pause for a reverent moment to remember that the Dutch invented capitalism. much appreciated by the inhabitants. vegetables at a time, then return home, but now they stay for months and are supplied by a weekly freighter, presumably at some cost in freshness and in the picturesque. sand, which commemorates the days of the Spanish Inquisition, when Jews had to meet secretly in private homes, and covered the floor with sand so people wouldn’t hear them go in and out. Luncheon was at the Grill King, in the old fort overlooking the sea, where I watched freighters go in and out and ate some splendid BBQ ribs in Chinese black bean sauce. Warren ordered some of the best shrimp I’ve ever tasted. Done in garlic and butter, I think, with a touch of curry. I will have to make experiments in that direction. We also got an early start on Carnival Fun by ordering Grill King Specials, a sinister blue concoction made of rum, blue Curaçao, pineapple juice, and other ingredients. Tasty, and about 100 proof. After the heat of the day grew oppressive, we returned to the hotel for siesta, and to rest up for Carnival. Carnival, we should remember, is Latin for “getting back to the flesh.” I planned to get back to the flesh in a big way. handed tickets for food and drink and a cushion to sit on. Noting that I happened to have six drink tickets, I opted for a six-pack of Amstel, which I carried back to the bleachers with me. (I didn’t want to miss any of the parade just ‘cuz I was thirsty.) Dinner turned out to be grilled chicken in peanut sauce, a crab salad, slaw. Nothing to complain about there. Our bleachers had a mistress of ceremonies, who did her damndest to pump up the crowd. It was a tough audience, as most of the group suffered from two serious disadvantages as far as Carnival fun was concerned. The national characteristics that built the best public health care system in the world are not necessarily the same traits that let one hang it all out on the Day of Getting Back to the Flesh. But the Canadians weren’t alone in this: even the locals in our bleachers were remarkably sedate. Maybe they were Carnival’d out. time with her head down and fingers jammed in her ears. fingers in one’s ear. I was into that flow thang, myself. dance?” our hostess wailed in despair. After three hours the last of the paraders passed. The crowd danced after, on into town to help with the ritual burning of El Rei Momo, the Carnival King. We, ears ringing, had to climb back aboard our bus for the trip to the hotel. At least we’d gotten back to the flesh. In 1977, the 230-foot-long cargo vessel SUPERIOR PRODUCER left Willemstad bound for the open sea. The ship was overloaded and began taking on water almost immediately. When the pumps jammed, the ship’s captain called for tugboats to come out and take him back to port. The tugboats scrambled and headed to the rescue. tugboat unless it actually tugs you somewhere, so the captain called the tugs and told them to go home. Which they did. At which point the freighter’s pumps failed again. The captain called for the tugboats, but this time they declined to respond, presumably filling the airwaves with salty Dutch imprecations. The captain turned SUPERIOR PRODUCER around and tried to get back to port on his own, but the harbor master was afraid the ship would sink in the channel and refused to open the bridge for him. SUPERIOR PRODUCER made a sharp 90- degree turn in order to avoid the harbor entrance, took on a lot more water, and sank. The crew all escaped in boats. I had Eileen as my dive buddy on this trip. Warren, who swims with his arms and a flipper on his one good leg, had decided to buddy with a divemaster on this trip, just in case he needed someone strong to haul him someplace. and tried to fling us off. There was a lot of particulate matter in the water from the unprecedented wind of the last few days, so there was nothing to look at as we went down, until suddenly the bow of SUPERIOR PRODUCER loomed up out of the blue below us. remark, “that fateful day in 1977.” The current was lessened close to the reef, so we we had no trouble floating up over the bows and then down through the open hatches into the cargo hold. eerie to find it there, still on the wall, like a mirror into another world. On the floor of the captain’s cabin was the hatch to the engine room. It was full of silt, wire, cable, and machinery, and did not look inviting. We did not go further. On our way back to the bow, Alan caught up with us and signalled us to ascend. We had reached our limit of 17 minutes. So back we went up via the mooring line, did our decompression safety stop at 15 feet, and back to the boat. It was disappointing not to find any large blue diamonds or pictures of a naked Kate Winslet, but it wasn’t bad even so. Our next dive was a drift dive at a place called Small Wall. In drift dives, the current works with you, so what we had was a nice relaxing dive, no exertion. The coral wall was lovely, though there didn’t seem to be much in the way of fauna. A large lobster, a small barracuda, a very big grouper. When we got back on the boat and were ready to head to port, divemaster Johann did a head count and found that two of our group were missing. So he flung on his gear and plunged back into the briney. There was modest suspense for five minutes or so– we weren’t terribly worried, since the dive was so dead simple it was difficult to picture a pair of divers screwing up— and then the two missing folks showed up. They hadn’t been lost, they’d just been taking their time. We had the medium-sized rijstaffel, which featured only 24 dishes. It wasn’t the best rijstaffel I’ve had, but some of it was very good, and none of it was awful. Warren was too tired to join me and Eileen after his earlier dives and the big meal, and therefore missed the best dive of our trip. From the pier overlooking the sheltered waters inside the breakwater, we could see a dozen or so large squid– “large” in this case being a little over a foot long– hovering in the water off the pier. I was looking forward to swimming with what Vivienne would have called the “squits,” but as soon as we entered the water, the squids vamoosed. They are very fast when they want to be. We swam on the surface to the entrance to the breakwater, then dropped to the bottom and followed the reef out to 50 feet. Turned right, floated along the reef. Once we got away from the lights of the pier, the water was utterly black, and the universe seemed narrowed to ourselves, weightless in the warm water, and the reach of our lights. We found some lobsters, a very large green moray, a large red crab, and a large number of porcupine fish. I caught one of the porcupines, and it blew up in my hands to a prickly sphere the size of a volleyball. I handed it to Eileen, who had not encountered one of these animals before, and who thought it was some kind of plant form until she let it go and observed that it swam off. Phosphorescence flew off our fins, and from our fingertips. The coral growths were brilliant colors in our lights. We got to the halfway point, rose to thirty feet, and returned. I was very proud of my navigation– I managed to bring us back through the breakwater and to the foot of the pier. As we climbed out of our gear, I looked down at the water and noticed that the squids were hovering there again, watching us with their big plate eyes. A weird omen, but not a particularly ominous one. 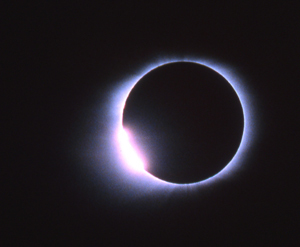 Next day was the solar eclipse. The bus for the eclipse site left at 8:00am, even though the eclipse wouldn’t start until 12:42, and there wouldn’t be totality till 2:12. You gotta give those astronomers time to set up their gear. And of course the early astronomer gets his choice of sites. We were the first group on the site. And then, once Kathy set up her Astroscan, which took maybe ten seconds, we had nothing to do. For hours. The government of Curaçao had assisted the cause of science by bulldozing flat about 20 acres near the island’s North Point. About 20 empty shipping containers had been piled up, two high, into a long wall to serve as a windbreak. Big concrete objects, the sort used to close off highways to traffic, had been scattered around to serve as bases for equipment. Tents had been set up as sun shelters, folding chairs and tables were provided, ambulances and a first aid tent stood ready, and local merchants were ready to provide food and drink. It was a first-class effort. Next time there’s an eclipse, the government of Curaçao will know what to do. 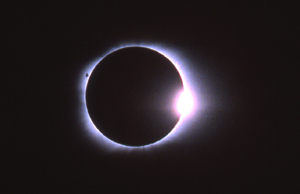 Unfortunately there won’t be another eclipse on Curaçao till the 27th Century. We sat around under canvas and read books and magazines and drank coke and beer. The astronomers stood in the strong sunlight on a flat hot surface and turned red as lobsters. Journalists wandered around looking for something to do. A French television scientist, who was introduced to us as the French Carl Sagan, wandered around looking for Francophones to interview. Fortunately a lot of the Canadians could parlez. The journalists got sufficiently desperate that a couple were even willing to interview a science fiction writer. I gave a lengthy interview to a British camera crew who, however, never got around to asking my name. And I also got interviewed by a print journalist from the island of St. Martin. If I’d known I was going to be interviewed, I would have had a few things ready to say. I don’t think I embarassed myself too much, though. By and by someone yelled “First Contact!” I had my camera ready to snap pictures of astronomers going berserk, but unfortunately all they did was peer into their equipment with renewed intensity. 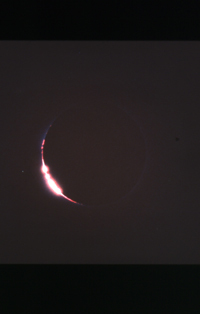 I looked at the sun through a mylar filter and, sure enough, there was a little bite taken out of the solar disk right at five o’clock. So I wandered around and looked at the sun through other people’s telescopes. Kathy had her Astroscan set to project the sun into large flat surfaces, like a piece of paper or a person’s tee shirt, so she was very popular with people who hadn’t brought their own gear, like all the Curaçaoan officials. 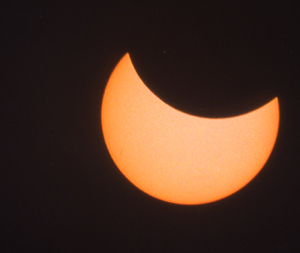 The moon crept across the sun’s disk, eating the few sunspots as it went. A pair of cruise ships anchored just offshore, no doubt smashing coral formations with their 3000-ton anchors, the swine. (Cruise ships are evil. Have I mentioned that?) I had thought the eclipse cruises would be farther out to sea, pursuing the track of the centerline, where the eclipse would last its longest, but apparently not. We had made friends with some of the astronomers, including Louis and Lynn of, I believe, Edmonton. Louis let me use his filter to snap pictures of the sun–for some reason we hadn’t thought to bring mylar along. It grew cooler. The sky grew darker. “Eclipse winds” began to blow– cool irregular gusts, even here in the trade wind belt. 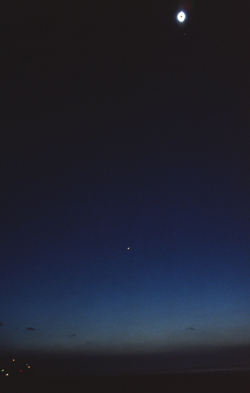 Venus appeared in the sky. you can get so caught up in the details of photography that you forget to look at the eclipse. all I’d have to do was raise the camera and shoot, and not have to think about it. fan. I looked at the sun through a mylar filter and watched it narrow, narrow . . and then it was gone. In the first fifth of a second I understood why people traveled thousands of miles to see these things. There was this huge silent silver RING in the SKY . It was the most awesome thing I’d ever seen in Nature. 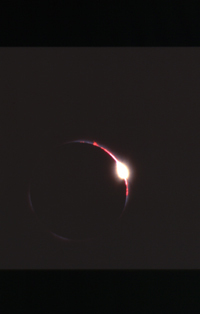 The chromosphere had a conspicuous red flare on it. I took a picture. up of intertwined filaments, with a very subtle structure. It spread out on either side about three or four sun-diameters, and curled up and down on the ends, like pairs of wings. Assyria a few millennia ago. I snapped pictures. 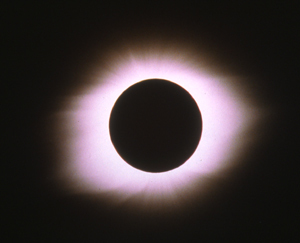 I looked at the sun with the naked eye and through binoculars, through which I could see details of the structure of the corona. 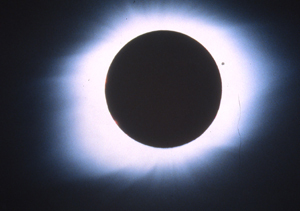 who stayed till Fourth Contact, when the moon completely vacated the solar disk. That night we hopped aboard a boat for a night dive at Tugboat, a site where a boat, which is NOT a tugboat apparently, is sunk in about ten feet of water. We cruised up and down the coral without seeing much– a couple spotted morays was about the sum of it all. The non-tugboat looked much more impressive at night than when I saw it the next day, in sunlight. Warren, on his first night dive, had some gear problems, and got disoriented in the dark. He decided to return to the boat after ten minutes or so, and bag diving for the rest of the trip. A pity, I thought. away late into the night. The day after the eclipse, Eileen and I went back to sea for a wall dive at a site called Black Rock. There was a high wind, a big surface chop, and a strong current running, and thanks to El Niño the current was running in the wrong direction, messing up the dive plan. We drifted along the reef with the current, barely noticing it, and then had to fight against the current all the way back to the boat. Fighting the current ran my air very low, which I hate to do, less for safety reasons than because it seems unprofessional. It was difficult to get back aboard in the chop, with the stern of the boat rearing up and then threatening to drop onto our heads with every wave. The corals were very nice, but once again there wasn’t much in the way of fauna. It was depressingly similar to Grand Cayman, except that on Cayman the corals aren’t in particularly good shape, either. I saw no tarpon, only smallish jacks, and the few barracuda were also small. The area had been pretty thoroughly fished out, I imagine by Venezuelans. “I’m not diving again!” she said. “Yes, you are,” he said placidly. And he was right, as it turned out. coral crevasse. The critter was almost cute. I also found a pair of flounder doing their flat flounder thing, and a couple scorpionfish, which are something of a hazard as they look very much like rocks and have highly inconvenient eight-inch spines loaded with poison. I wouldn’t have spotted one of them except that it was swimming. Its fins flash bright colors when it swam, a contrast to the greygreen of its skin. That evening we returned to the eclipse site for some night viewing. I had specifically requested this, since the earlier viewing nights were scheduled against Carnival events. “Assuming that some of us are depraved enough to want to attend Carnival,” I said, “can we go look at stars on Friday night?” And Nicole of Travel Exchange went and rented us a whole bus. This was neat. Only about a dozen of our Calgary group attended, but there were swarms of astronomers on the site when we got there, mostly from Toronto but including some Germans who accidentally locked their keys in their rented car and thus hitched a ride home with us. The skyscape was magnificent, clear as crystal. The Southern Cross was a tilted diamond on the horizon. I was able to see a great many nebulae with the naked eye, and made a nuisance of myself asking the astronomers what I was looking at. (“IC-something-or-other,” I was often told.) Eta Carina, the Southern Pleiades, and (rising above the shipping containers at the last minute) Proxima Centauri. Unfortunately the Megallanic Clouds sank with the sun, and we therefore missed them. I could get used to this, I really could. stopa di kabrito, described on the menu as “goat stew.” It should have been “stewed goat,” as the goat meat and the stew had long since parted company. Tender, flavorful, a bit spicy. It was served with a local dish, quite bland, made from steamed corn meal. Not a vegetable in sight. I wished I had ordered a salad along with all the animal protein. Eileen, who had ordered stewed cabbage, came up with a winner: sweet, spicy, with flavorful chunks of meat. it’s in a bad neighborhood, though it looked middle-class enough to use, with those Dutch lace curtains in the windows. By Saturday the 28th, our last day, the tropics had really got to us. The long walk from our room to the dive pier was getting longer and longer. Eileen dropped out of the diving, so I went alone. Fortunately the highly stimulating Vivienne was our divemistress this time out, which gave me a place to rest my weary eyes when I wasn’t under water. deeper than we’d agreed. He’d never done a drift dive before, and hadn’t realized that you’re just supposed to drift with the current (which was quite fast), so he was kicking along and moving very, very, very fast, with the reef soaring by so quickly that I really didn’t have time to look for goodies. Toward the end of the dive, the reef made a turn, and the current started carrying us down and away, into the chasm, a fact I only discovered when I looked at my gauges and discovered I’d been carried to 82 feet, from my self-imposed limit of 60! “Dive the reef, not the chasm” has always been my motto. It was a hard slog into the current to get back to our boat. Below the boat, on the flat part of the reef, I saw a couple fish of a type I’d never seen before. They were squat, grey-brown things, with a broad head, just sitting on the sand. Maybe 12-14 inches long. They were strongly reminiscent of the scorpion fish, except that they weren’t, lacking (insofar as I was willing to investigate) the poisonous spines. I checked in my fish guides and didn’t find them. Our surface interval was spent cruising the Spanish Water, one of the island’s many inland lagoons. The most famous of these is Willemstad, but there are a number of others. The Spanish Water is full of little mazy inlets, peninsulae, and small islands, all of which are rapidly becoming occupied by luxury villas and private piers. They all looked very nice. I’d guess they each ran $3-5 million, many with a less-than-charming view of the sandstone quarry. lips at one end and a tiny tail at the other. After lunch and siesta, the four of us went out on the town, and wandered about Willemstad. We crossed Queen Emma’s Bridge to Otrabanda, on the far side of the ship canal, and found out where the poor people lived. It was a little too reminiscent of an inner-city slum for comfort, so we wandered back to the channel and drank beer in a sidewalk cafe while watching the sunset play on the Caribbean colors of Punda. Then we crossed back over the bridge and wandered about, hoping to find a place to hear island music. The choice seemed to be between ear-splitting highly-amped jazz in a sidewalk restaurant, or AOR Top-100 hits at the Hard Rock Cafe Society, a club that will last just as it takes for a real Hard Rock Cafe to open on the island. it wasn’t on, so we returned to the Grill King for exotic rum drinks and dinner. Warren and I switched dishes from our last visit: he had the ribs in black bean sauce, I had the wonderful grilled shrimp. There didn’t seem to be much night life going on– one is reminded of the Dutch influence, I guess– so we headed back to the hotel. airports. The few remainders of the Calgary Group had a big dinner together in Miami the last night, fourteen of us at a big table at a restaurant called Victoria Station, made up of old railroad cars hooked together. The margaritas were served in big 16-ounce tumblers. The food was pretty good. The waitress was patient. And then, the next day, home, where Steve and Laura kindly picked us up and fed us dinner. Kathy had got the flu. I had got a tan. I was ready for another adventure.